First round of three-date regatta to be held Jan. 6. SANTA BARBARA — Santa Barbara Yacht Club will host the 2018 Hot Rum Series on California’s Central Coast beginning Jan. 6. The three-date race will resume with its second segment on Jan. 27 before completing the final dash. Feb. 10. The Hot Rum Series kicks off Santa Barbara YC’s 2018 racing calendar; other regattas and championships scheduled for Santa Barbara sailors in January 2018 include Centennial Regatta (Jan. 13-14) and All Fleet Club Championship (Jan. 13). Taxi Dancer won the first race of the Hot Rum Series in 2017, finishing ahead of Warrior, Venom and Prevail. Venom finished the series in first place overall, followed by Taxi Dancer, Warrior, Average White Boat and Repeat Offender. More than two-dozen sailors participated in the 2017 regatta; the number of participants for the 2018 edition of the Hot Rum Series was not available as of press time. 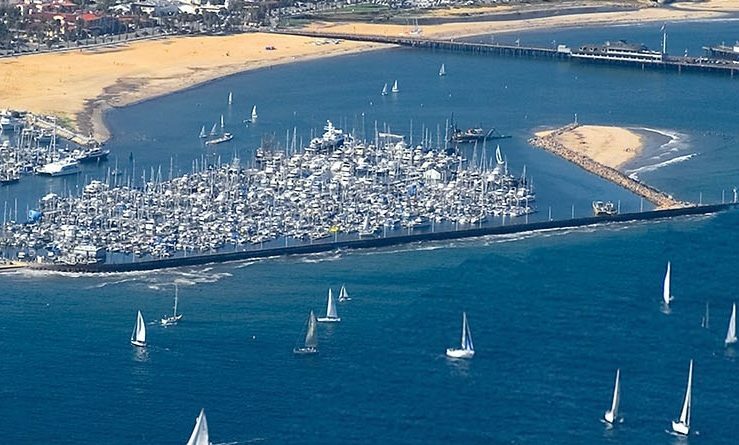 Santa Barbara YC will provide a course chart to all participants; charts will also be posted on placards at the yacht club’s deck. A perpetual trophy will be awarded to the series’ overall PHRF winner. Visit sbyc.org for more information about the series, including Notice of Race, Sailing Instructions, course chart and online entry form. Staghound, Ohana, Fox and Wani Racing rounded out the series’ top 5 finishers. San Diego YC’s Hot Rum Series featured 140 teams.